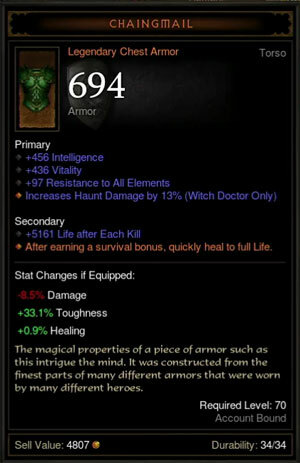 Found the legendary chest armor Chaingmail which dropped in Wortham from dead body on torment 1. Watch this video on Youtube! Diablo® and Blizzard Entertainment® are all trademarks or registered trademarks of Blizzard Entertainment in the United States and/or other countries. These terms and all related materials, logos, and images are copyright © Blizzard Entertainment. This site is in no way associated with or endorsed by Blizzard Entertainment®.